1764-1841.The son of Captain William Anthony Halsted and his wife Mary Frankland, he was born at Gosport on 2 April 1764. He was the brother of Lieutenant Charles Halsted who died when the Blanche 32, Captain Samuel Uppleby, was lost in the Great Hurricanes of October 1780, and of Captain John Halsted. Another brother, Commander George Halsted, entered the service on the Ganges 74, Captain Sir Roger Curtis, was promoted lieutenant on 27 May 1796, from June that year until 1800 served under Lawrence Halsted aboard the Phoenix 36, was promoted commander on 21 January 1809, and superannuated as a captain in 1840. Halsted entered the service in 1776 aboard his father’s hospital ship Jersey 60, employed on the North American station. In May 1778 he removed to the St. Albans 64, Captain Richard Onslow, who had become his patron following the recent death of his father, and he was present as a midshipman at the Battle of St. Lucia on 15 December 1778 before this ship returned to England with a convoy in the summer of the following year. Despite the fact that the St. Albans was in poor repair she was attached to the Channel fleet during its retreat of August 1779, before in February 1780 Onslow and his officers and men transferred to the Bellona 74. On 30 December this vessel captured the Dutch Princess Carolina 54 in the Channel with the assistance of the Marlborough 74, Captain Taylor Penny. Halsted was commissioned lieutenant on 8 December 1781 and appointed to the Bellona’s prize Princess Caroline 54, Captain Hugh Bromedge, going out to the Leeward Islands. Here he became the third lieutenant of the Canada 74, Captain Hon. William Cornwallis, in which he fought at the Battle of the Saintes on 12 April 1782. The Canada thereafter endured the tribulations of the Central Atlantic Hurricane in September which claimed the captured French flagship Ville de Paris and many other vessels, before she eventually arrived home in October. Remaining under Cornwallis’ wing, Halsted joined the Portsmouth guardship Ganges 74 with that officer at the beginning of 1783, which vessel was successively commanded from February by Captain Thomas Boston, from April by Captain Hon. James Luttrell, and following that officer’s retirement ashore because of ill health in 1784 by Captain Sir Roger Curtis. The Ganges was eventually paid off in December 1787. After a period on the beach Halsted rejoined Cornwallis with his appointment at the end of 1788 as first lieutenant of the commodore’s pennant ship Crown 64, Captain James Cornwallis, departing for India in February 1789. Here he was promoted commander of the sloop Atlanta on 22 November 1790, in which he undertook survey work. On 31 May 1791 he was posted captain of the Crown, but after six months he rejoined the Atlanta, and from 1792 he commanded the Swan 14 in the East Indies. He returned to England with the Swan, arriving at Portsmouth in March 1793 and paying her off in May. HMS Phoenix seen in action some years after Halsted commanded her. With war against France having broken out Halsted was appointed acting captain of the Invincible 74, serving in Rear-Admiral John MacBride’s squadron, whose flag he occasionally flew prior to briefly taking the acting command of the frigate Flora 36 in March 1794 for Captain Sir John Borlase Warren when that officer attended Parliament. In April 1794 he recommissioned the Hector 74 and served as flag-captain to Rear-Admiral George Montagu thereafter, including during the Glorious First of June campaign. In August he recommissioned the London 98 for service in the Channel with Montagu’s flag, and from January – October 1795 he had the thirty-five year-old Venus 32 in the Downs and the North Sea. Having recommissioned the eighteen-pounder Phoenix 36 in October 1795, Halsted joined the North Sea fleet and led a squadron in the capture off the Texel of the Dutch frigate Argo 36 on 12 May 1796, this vessel later being bought into the service as the Janus. About this time Lieutenant Edward Pelham Brenton, with whom Halsted had served aboard the Crown, left the ship following a disagreement between the two. After a stint in the Channel the Phoenix served off Wales from September 1797 until August 1798, and for the ensuing nine months on the Irish station. During this time she took several prizes including the Espièglle 4 off Waterford on 18 May 1797, the Brave 1 off Cape Clear on 24 April 1798, the Caroline 20 on 31 May, and the Foudroyant 20 on 23 January 1799. 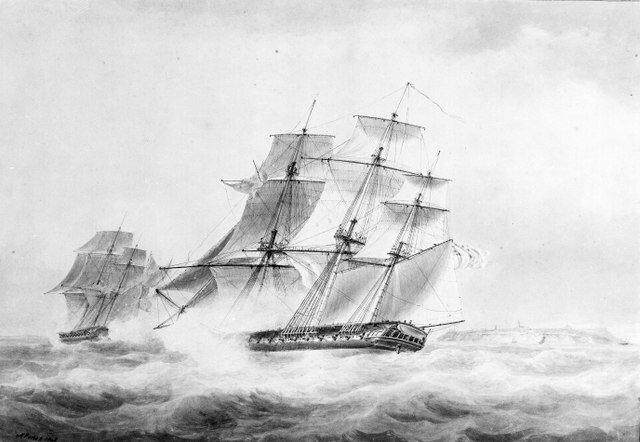 After sailing out to the Mediterranean in May 1799 the Phoenix was in company with the fireship Incendiary, Commander Richard Dunn, when they took the privateer Eole 10 off Cape Spartel on 11 February 1800, then with the Port Mahon 18, Commander William Buchanan, when they captured the Albanaise 12 on 3 June. Two weeks later on 17 June Halsted’s frigate captured the Revanche 4, although she capsized the next day. She was later present at the reduction of Genoa on 4 June 1800, and her boats led by Lieutenant Hood Hanway Christian participated in the cutting-out of the galley Prima. On 3 August 1801, whilst cruising in the Ligurian Sea with the Pomone 40, Captain Edward Leveson Gower, and the Pearl 32, Captain Samuel Ballard, Halsted witnessed the capture by the former of the French frigate Carrère 40. Towards the end of that month the Phoenix herself became the object of a planned attack off Piombino when the French frigates Succès 32 and Bravoure 40 were despatched after her, but she was quickly joined by the Pomone and the Minerve 38, Captain George Cockburn, with the result that both French ships were driven ashore on 2 September. The Succès was re-floated by Lieutenant Charles Thompson of the Phoenix and restored to the British colours she had worn prior to her capture by the French on 13 February when under the command of Captain Shuldham Peard. In July 1802 Halsted returned to England with the Phoenix and paid her off. After three years of unemployment he recommissioned the Namur 74 in March 1805, served as flag-captain to Rear-Admiral Thomas Macnamara Russell in the North Sea, and was off Brest when Admiral Hon. William Cornwallis’ Channel fleet stood in to engage Vice-Admiral Honoré Ganteaume’s French fleet on 22 August 1805. He was later awarded with a gold medal after commanding the Namur as a private ship in Commodore Sir Richard Strachan’s action with Rear-Admiral Dumanoir Le Pelley on 4 November 1805, although he suffered the ignominy of being fired on by his irascible commander when it was considered that his vessel was dilatory in responding to orders. Although the Namur was slow into the action, trailing her compatriots by some ten miles, she arrived in time to take possession of the already damaged French flagship Formidable 80, suffering four men killed and eight men wounded in the process. A month later the Namur formed part of Vice-Admiral Sir John Borlase Warren’s squadron that was sent in chase of the French squadrons from Brest under Admirals Leissègues and Willaumez, a chase that ended with the former’s defeat at the Battle of San Domingo, and the latter’s dispersal in a storm on 18 August. Halsted paid the Namur off in July 1807, and in December he became captain of the fleet to Admiral Sir Charles Cotton on the Lisbon station aboard the Minotaur 74, Captain Charles Moore Mansfield, removing with Cotton in the ensuing month to the Hibernia 100, Captain Robert Jenner Neve. He provided valuable advice following the controversial Convention of Cintra on 30 August 1808, and was sent home with despatches. On 31 July 1810 Halsted was promoted rear-admiral, on 4 June 1814 vice-admiral, and he was created a K.C.B. on 2 January 1815. From 1824-7 he was the commander-in-chief at Jamaica with his flag aboard the Isis 50, Captain Thomas Forrest, and with his nephew, George Halsted, serving as his flag-lieutenant for the latter two years. He was advanced to the rank of admiral on 22 July 1830, was created a G.C.B. on 24 February 1837 and died at Stoke Damarel in Devon on 22 April 1841. On 7 September 1803 at Mylor in Cornwall Halsted married Emma Pellew, the eldest daughter of the future Admiral Viscount Exmouth, with whom he had issue four sons and seven daughters. His second son, Edward Pellew Halsted, entered the Navy on 1 March 1821, was promoted commander on 6 December 1836, and after three years service in China was posted captain on 15 April 1842 before later reaching flag rank. His youngest son, Lieutenant Lawrence Halsted, died whilst commanding the steam-sloop Spiteful at Bombay on 7 November 1847. One of his daughters, Julia, married Captain Richard Harward in 1834. His eldest and third son both entered the Indian Service, the elder in the military and the younger in the civil service.